A revitalization project has begun for Northport Village. Northport, NY - August 26, 2013 - Suffolk County Legislator William R. Spencer (D-Centerport) stood with Northport Village officials and representatives from the Northport Chamber of Commerce, Northport Arts Coalition, and Northport Historical Society and other interested parties, to announce that the Suffolk County Downtown Revitalization Citizen’s Advisory Board has approved Northport’s application for grant funding for a kiosk and information board project. The Downtown Revitalization Program provides funding for the redevelopment and revitalization of Suffolk County downtowns. Funds are awarded on a competitive grant basis using a merit based scoring system. Applications receive points for leveraging of additional funds, economic impact, reasonable expectation of completion, overall downtown improvement, and proximity to downtown. Since the project’s Round I of funding in 1999, through the most recent Round X of funding in 2011, a total of $6,753,941 has been appropriated for various downtown revitalization projects. On April 22, 2013, the County Executive announced that the Suffolk County Downtown Revitalization Citizen’s Advisory Board would be accepting applications for Round XI grant funding in the amount of $250,000. As per the announcement, applicants had to be organizations that represent a downtown area and as well as partner with their local municipality. Organizations that represent downtown areas include business improvement districts, chambers of commerce, civic associations, historical societies, beautification societies, and local development corporations. In this case the Northport Chamber of Commerce, in partnership with the Northport Arts Coalition supported by Northport Village, the Northport Historical Society, the Northport Rotary, Vision Long Island and many other organizations, applied for the grant. The purpose of the project, according to the application, is to “create a place where not only village residents but also out-of-town visitors can go to and avail themselves of all the businesses, shops, restaurants and museums within walking distance in the Village of Northport. 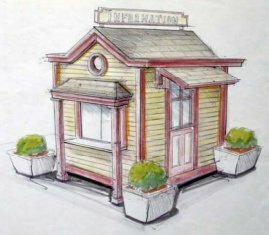 The historically designed building will be Northport’s place to go for any and all information on cultural events, schedules for nonprofit community events and outreach, and a rich visual history of The Village of Northport.” An 8’X7’ kiosk building and two kiosk boards will be strategically place in the Village Park. Northport Village passed a resolution supporting the project in June, 2013. The Suffolk County Legislature will vote on the final resolution approving all of the Round XI projects at the beginning of October, 2013. Legislator Spencer would like to encourage residents to contact his Legislative colleagues to encourage their support for this resolution. Contact information for the Suffolk County Legislature can be found on our website at http://legis.suffolkcountyny.gov/. Subject: LongIsland.com - Your Name sent you Article details of "Legislator Spencer Announces Northport Village Application Approved for County Downtown Revitalization Grant Funding"